Eau De Toilette Spray 3.4 Ounces.A resolutely masculine fragrance born from the sea, the sun, the earth, and the breeze of a Mediterranean island. 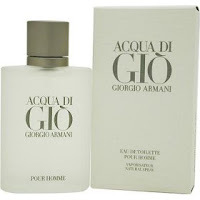 Transparent, aromatic, and woody in nature Aqua Di Gio Pour Homme is a contemporary expression of masculinity, in an aura of marine notes, fruits, herbs, and woods. Fragrance notes: citrus notes, rosemary spiciness, jasmine, hint of wood and ocean breezes. Recommended use: casual.